This movie shows the "Bouguer" gravity of Earth's moon based on data from NASA's Gravity Recovery and Interior Laboratory (GRAIL) and topography from the Lunar Reconnaissance Orbiter's Lunar Orbiter Laser Altimeter. 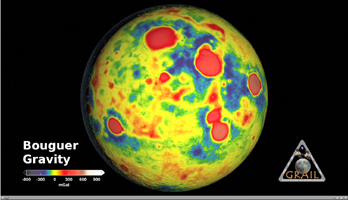 Bouguer gravity is what remains from the gravity field when the attraction of surface topography is removed, and therefore represents mass anomalies inside the moon due to either variations in crustal thickness or crust or mantle density. The prominent nearside circular highs (in red) indicate the well-known mass concentrations or "mascons,"but many similar newfound far-side features are also visible.